* Fertilizers that contain organic plant nutrients. The larger quantities of readily available (soluble) plant nutrients in chemical fertilizers have a greater potential to cause unbalanced plant growth. And that's why nutrient ratios (fertilizer formula) have been an obsession with some gardeners. But organic gardeners needn't worry too much about this complexity. They always say nitrogen for leaves, phosphorus for roots, potassium for etc... ... But growing plants need all the major nutrients and more. Remember that you are growing whole plants, not leaves without roots, or flowers without leaves. See my pages on organic fertilizer and making garden compost. Above all, ensure that your plants have a complete range of nutrients to the minimum level. What are these nutrients? What do they do? ... Then the minor plant nutrients also known as trace elements absolutely must be present for healthy growth. N : P : K refers to the relative quantities as a percentage by weight of nitrogen : phoshate : potash. On fertilizer packs the N : P : K provides a standard declaration of plant nutrient content. Potash (K2O) multiplied by 0.83 equals Potassium (K) element. The N : P : K standard arose when chemists analysed plant nutrients as compounds. Gardeners normally use N : P : K i.e. nitrogen : phosphate : potash to compare fertilizer contents and more importantly plant requirements. Nitrogen (N) is always needed in relatively large amounts to make all plant proteins. Leafy crops such as cabbage, kale, lettuce, chard, rhubarb, and potatoes obviously need more. Fruit and seed crops such as marrow, pumpkin, cucumber, melons, sweet corn, also need sufficient N to make the leaf area they use to produce high yields. Large N quantities cause lush sappy growth. Use on regularly cut spring lawns. But use less in autumn. Lawn fertilizers are here. Nitrogen is made available to plants mainly as nitrate or ammonium. Nitrate nitrogen easily washes out of the soil during winter rains. Nitrate fertilizers may increase soil ph. But ammonium N sticks to the clay soil. So when animal manure is applied in the fall more of the N is retained as ammonium N. Ammonium fertilizers can cause a decrease in soil ph. Large amounts of ammonium N can cause deficiencies in plant nutrients: calcium, potassium, magnesium. That's because it competes with these for uptake by plant roots - see my upcoming page on growing tomatoes. Changes in ph may also make nutrients unavailable. N is either used up by garden plants or washed out by autumn and winter rains. The loss can be reduced on cleared ground by growing an N lifting green manure like Rye grass. This turns the excess soil nitrogen into organic plant nitrogen which is recycled by digging in or composting the green manure. Organic gardeners grow green manures such as clovers, tares and vetches to encourage micro-organisms that fix N from air. Gardeners and farmers can also inoculate the earth with micro-organisms. Try them out here. Organic N can be applied with animal manure in autumn and winter - release of N from composted manure takes a little time over winter because the organic matter has to be broken down by micro-organisms. Composted Chicken manure is an excellent organic N fertilizer. Organic N is also contained in:- feathers, blood, corn, soybean and fish meals which can be applied when planting and as top dressings. Organic gardeners don't approve of using Urea. You can get dried and pelleted manure in bags and tubs here. Phosphorus (P) is important for growth. All plants need it from day 1 to grow good roots to support the plant later. P nutrients increase leaf area but, unlike N, without reducing transport of sugars to the root. For this reason perhaps, P is used to establish a strong root system in young plants, fruit and shrubs. It is useful alongside K for root crops: e.g. carrots, beet, parsnips. The response to Phosphate fertilizer may result from a Phosphate unavailability in soil or slow rates of Phosphate release to demanding plants. A Nitrogen only fertilizer may cause plant deficiency in P.
Huge amounts of Phosphate fertilizer are lost in agriculture by surface run off. Always work Phosphate fertilizers into the soil surface and place close to the growing root zone. Organic gardener's can apply P using bone and fish meals, composted guano, gafsa or rock phosphate. There's also a considerable amount in chicken manure. Bone Meal is available here. But is it any surprise to learn that plants are able to dissolve some unavailable P that's close to their roots in much the same way that chemists extract it in the laboratory? Again, micro-organisms are very important here - find more on microbial/mycorrhizal treatments here. They demonstrate the value of organic methods over factory farm soil. Potassium (K) is involved in plant processes and in cell-sap. K increases protein synthesis from nitrogen. K helps plants produce flowers, fruit and seeds. It helps the plant absorb and hold onto water. Root crops respond well to Potash. Potash also causes plants to grow coarser tougher vegetation more resistant to disease and winter hardened. This explains why the amount of Potash in Fall lawn feeds is increased. K (Potash) is contained in:- wood ash, vinasse, comfrey leaves, kelp meal, and composted stubble. You can find special blended plant nutrients with organic potash for flowers and fruit here. Calcium (Ca) very important both as a plant nutrient and soil conditioner. Ca forms the cement holding plant cell walls together. It also has a role in root development. Unlike the 3 plant nutrients mentioned above, Ca is not re-mobilised from older leaves into new growth. Therefore shortage of Ca affects the growing tips to cause browning or die back. 'Blossom end rot' in tomatoes, 'bitter pit' in apples and similar browning in Brussel Sprouts and cauliflower may be due to lack of Ca. But as Ca is transported by water irregular water supply in tomatoes is often given as the cause of 'blossom end rot' rather than an actual Calcium shortage. This page will be updated with details other important nutrients in due course. These included magnesium, iron and micronutrients. Organic fertilizers like manure, seaweed, are particularly useful at providing the full range or plant nutrients that your plants need. Find out more on these pages. BioBoostTM All-Natural Foliar Fertilizer Can be used everywhere, flowers, shrubs, veg, fruit, and pot plants. It will increase performance while reducing normal fertilizer needs. There's more on information on this link. Yield Booster for peas, beans ... 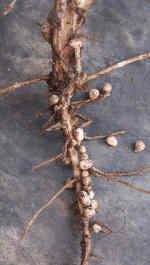 Beans usually associate with bacteria in root nodules. But some soils lack inoculant. Help your pea and beans make more nitrogen - its what they need and what they do naturally. Plant Success Mycorhizae Tablets 40ct	 bring many benefits to improve growing plants and production. Similar products are recommended by the Royal Horticulural Society and many gardeners testify to getting good results. How to use organic fertilizers & how they work..
books to help organic gardeners.